Remember that feeling you have on the first day of a holiday? All possibilities lie ahead of you, finding a fantastic little restaurant, finally finishing that novel you keep falling asleep at night over, re-connecting with your partner or kids? And then suddenly, it’s the last day. And it’s all over. If you have been lucky with the weather, filled your days with things you loved doing, enjoyed time with the people you travelled with, then chances are, you’ll be ready to go home. Some of those elements you don’t have much control over, but many you do. I try to remind myself that to a great extent, it’s only my choices that are creating the life I am living, so if it isn’t the one I want I am the only one to blame. I attended a seminar recently where the speaker said, at the end of each day, write down something or someone that you are grateful for being in your life, that day. She said ‘you’ll be surprised how much you have to be grateful for’. She was right. 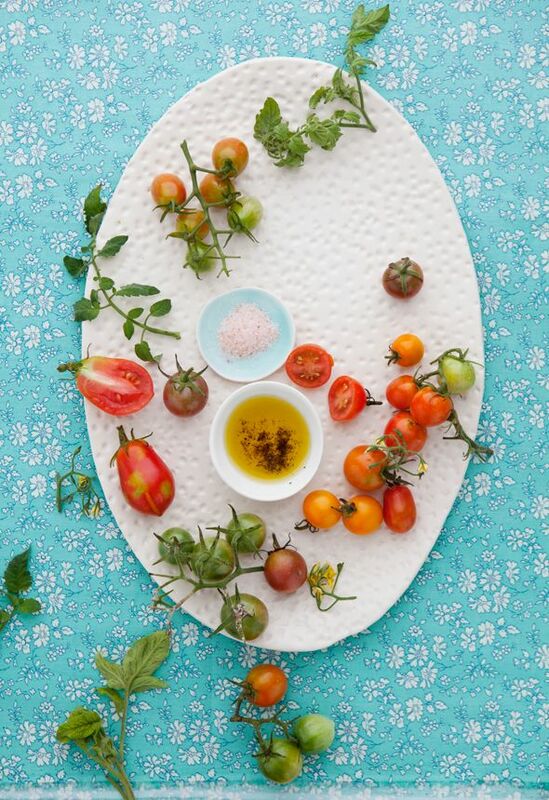 Be kind to yourself, life isn’t always perfect but there’s always something good to be found if you look for it, even if it is as simple as a beautiful image of freshly picked tomatoes on a plate. Have a look at Aran’s blog who took this gorgeous photo above. She’s a food stylist who lives in the US, originally from Basque country and I love her work. So, tell me one positive thing about your day? I had a great time with my granddaughter practising writing “I love Granny”..gotta love that. I went to a seminar on dealing with people with mental health issues for our local volunteer ambulance branch a few weeks ago and one way to keep healthy for ourselves was to keep a gratitude journal rather similar to the idea given to you. They presented us with a coloured notepad at the end of the course to get us started and suggested we write something in it everyday…mindful gratefulness – why not! Lucky granddaughter to have a grandma like you! Mindful gratefulness seems such a simple obvious thing, and yet those little everyday practises sometimes mean the most, but often they are lost in the chaos of everyday life. It’s good to have an ‘anchor’ when the seas get choppy.